It's All Good "Magic Bites" Review "Warning: Graphic Content!" 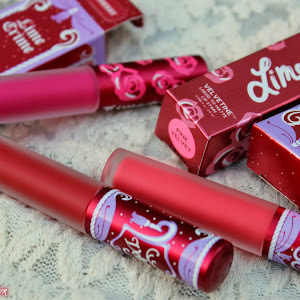 **Giveaway Closed** ♥ | LIPS n BERRIES! Did I manage to grab your attention with that tagline? Yes? It served the purpose then! I'm not going to post any gory pictures here. Sorry! Halloween is done n dusted! So are you prone to insect bites? Sand flies? Mosquitoes? I'm that type..!Yes..I'd like to put it that way. I have given up trying to fathom why on earth when the lawns are freshly mowed, I'm all itchy n scratchy & other housemates don't even flinch. I'm that type unfortunately! Come spring n summer... I get attacked by sandflies..sometimes 10-15 bites at one place (at the moment.. my right knee and left feet), like some fly went for evening stroll & decided to drop 'bread crumbs' on the way. I'm so tempted to share a photo of one such lazy stroll but I'll spare you the horror 'just because' we are in a public domain here. Oh check out the less gory version below! 6 bites in total.. Are you a game? Spot them!!! The bites always start tiny as..the more you scratch, the bigger they get and there's no limit to how big they can get. The urge to scratch is just too much (even Sunshine agrees.. he got a couple this season; he feels my frustration now). They go big & red and won't heal till the day you stop scratching them (can go on for weeks). When you learn to curb the urge, it goes purple-y & then brown and then the scars take a month to disappear. I've so many life cycles of these bites going on my body at the moment...might just do a photo diary!! I've also stopped analyzing where I get them from.... grass & freshly mowed lawns were the initial culprits but now I get them on my feet while shoes on; in my bed during sleep; from freshly washed laundry and other unidentified sources. Its pretty much right there in the air for me. Can't hide can't escape! You already know that my Trilogy's‘Everything Balm’ works a breeze on these nasties. I’m so addicted to it. Now coming to my recent find (I just take forever, don't I?) 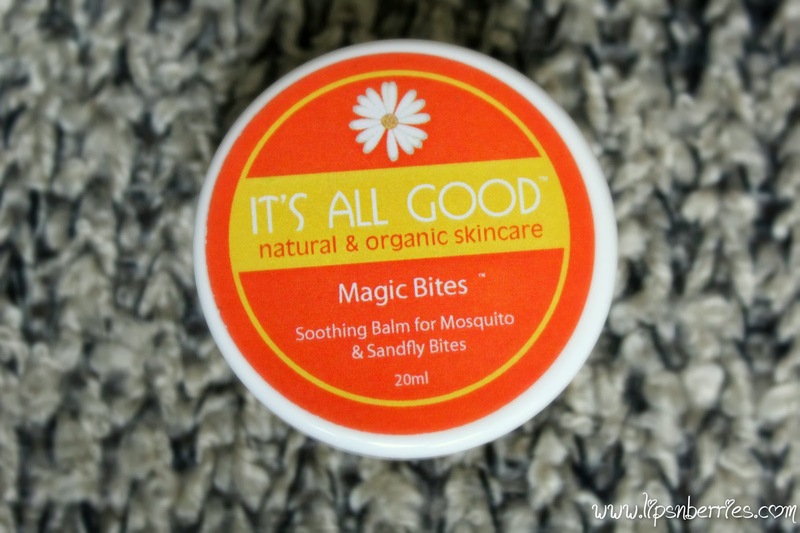 – Its All Good Natural and Organic Skincare's ‘Magic Bites’. I cannot explain in words how much I adore this stuff. 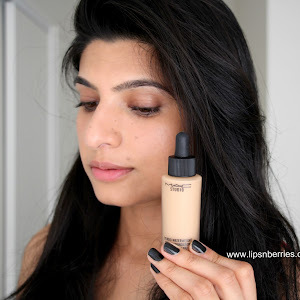 When the folks at It's All Good asked me to choose from their product range… this is what I wanted to try the most. 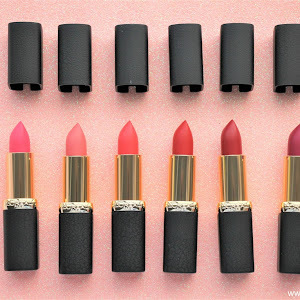 Unlike moisturizers and cleansers where it takes months to notice a difference, ‘Magic Bites’ is something I can instantly tell if it works or not. I've been digging this super cute tub since the very minute I received it in mail. A smooth, beige-y balm that claims to soothe bites (not just my absolute fav sandflies). So does it work?? Yes! Beautifully. I had a massive sand fly attack the very day I received this so you can trust my judgement when I say "This stuff works"! Unlike previous outbreaks which lasted for about 2 weeks, this one did soothe & heal them in two days flat. The itching stops (not immediately though) and the bite goes brown in a couple of days which is magic for me. So aptly named! It's smell might take some time getting used to, which isn’t an issue unless you get a nasty bite on your pretty face! It gives a warm sensation when put on a bite.. I know it well coz one fine night I incidentally used it all over my hands instead of a hand cream and boy! it was warm. 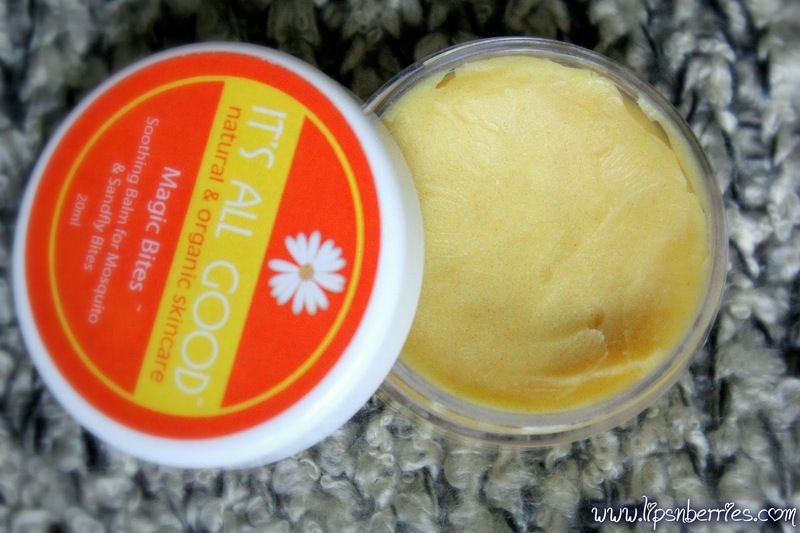 It doesn't sink into skin immediately, it's a balm so expect a bit of oiliness. The 20ml tub is super cute.. so girly! Honestly, I don't even care about all this fluff. It works and I'm so buying this again. Get it if you are prone to bug bites. Don't even dare going camping without this!! Where to buy it from? 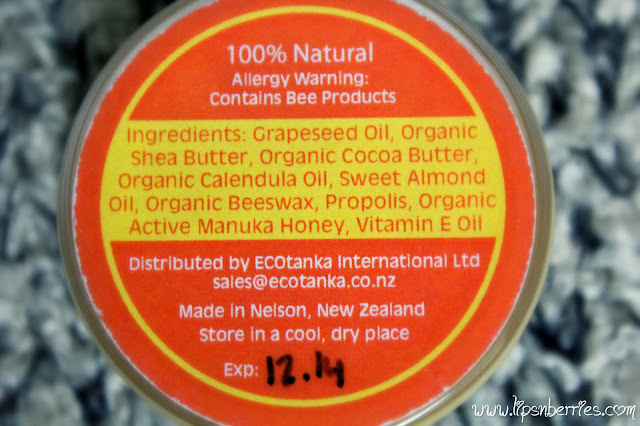 Email lovely Sharon at sales@ecotanka.co.nz to be directed to your nearest retailer or best just google it. There are heaps of online retailers out there! I have an idea.. may be do NZ manufacturers a favor and ask your nearest health store to stock these amazing natural products. 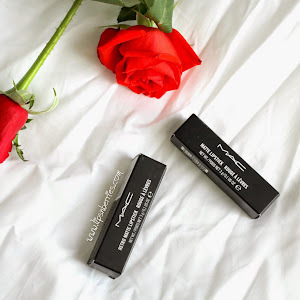 Giveaway closes on November 18th, 2013 (Monday!) Happy sharing people. So, are you prone to bug bites as well? What's your secret remedy? I'd love to know.. I know! It's great to have something natural for the nasties..! I'm sure the mozzies know me. I've been in NZ for 27 years & they still have the impression that I'm fresh imported meat. Wow they go hell for leather on me, I would love to try this it sounds perfect.